Designing and installing bespoke commercial elevators in London and the surrounding region for more than 15 years. Tower Lifts is proud to offer the most comprehensive range of business elevator systems and solutions for commercial and industrial properties of every shape and size. If looking for a commercial lift company that takes your business interests as seriously as you do, reach out to a member of the Tower Lifts London customer support team today for an obligation-free consultation. What sets Tower Lifts apart from other London lift installers is our comprehensive commitment to innovative, dynamic and bespoke commercial and industrial elevator systems. The combination of our creativity and the latest technological innovations the industry has access to results in the design and delivery of unrivalled vertical transport solutions. We understand and appreciate the importance of commercial elevators that are not only reliable, but comprehensively safe and a reflection of the professionalism of your business in general. Bespoke Scenic lifts – A comprehensive range of elevators that focus on aesthetics and the overall experience as much as practical transportation. A beautiful addition to any office or workplace. Low Pit Headroom Restrictions – We can design and install elevator systems in buildings and premises where it may seem difficult or even impossible to get the job done. Our experience and expertise extend to all types of commercial elevators in London. Public Building Passenger Lifts – If you welcome members of the public or visitors to your premises, we can help provide you with a safe and reliable elevator system for public use. Once again, focusing on a bespoke solution that both gets the job done and speaks volumes for your professionalism. To discuss any of our business elevator systems or to arrange an obligation-free quotation, reach out to a member of the Tower Lifts customer support team today. We understand the importance of complete peace of mind when it comes to projects and installations as vital as vertical transport systems. 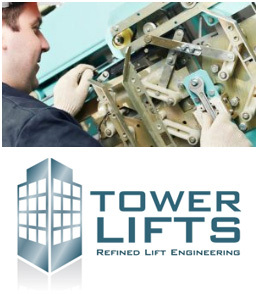 When working with Tower Lifts, your business will benefit from the skills and talents of a team of engineers with more than 15 years’ experience in the design, installation and on-going maintenance of all types of commercial lifts for all business premises. 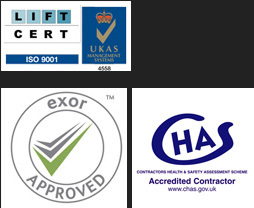 We are a ISO9001:2008 Lift Cert and UKAS approved company adhering to all applicable regulations and legislation, guaranteeing your business superior performance and value for money. What’s more, we are also happy to work with existing commercial elevator systems in need of improvements. Whether looking to enhance the reliability, performance or visual appeal of your current vertical transport systems, we can make it happen. To learn more about any of our services or to discuss your requirements in more detail, get in touch with the Tower Lifts customer service team today.